Methods and devices are disclosed for a gaseous liquid to audibly deform the shape of a closed container. One embodiment includes pushing inward to depress a plurality of deformations integral with an exterior of the plastic container having a bottom, a top, the exterior, and an interior, wherein the top is at least partially opened. Further, the method includes sealing, subsequent to the depressing, the top to close the plastic container. Further still, the method includes pushing outward, subsequent to the sealing, by carbonation from a carbonated liquid contained within the interior, on the plurality of deformations. Yet further, the method includes deforming, by the pushing outward, at least two of the plurality of deformations to displaced positions. The method also includes creating two or more sounds and/or movement by the deforming. 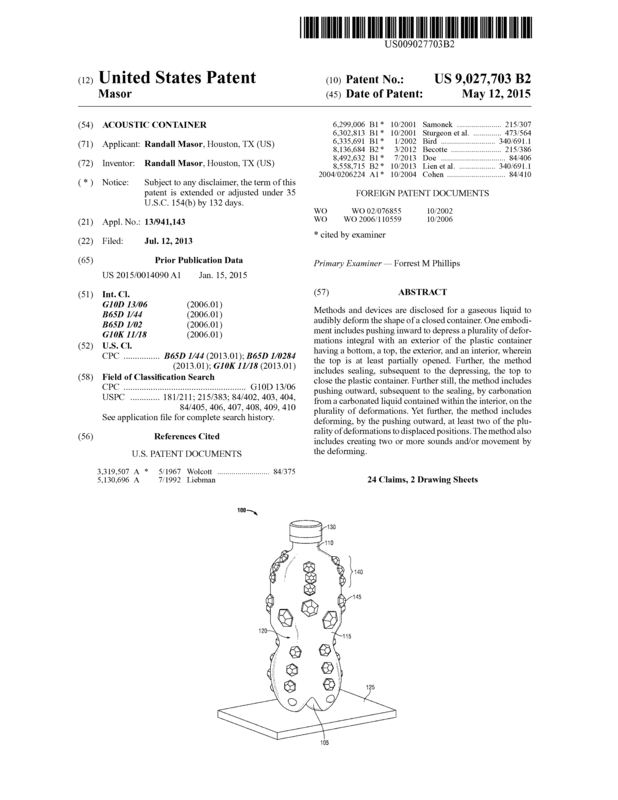 In short I invented a plastic bottle for a cola..pepsi carbonated drink.It pops a range of sounds and can rock and roll .ITS THE NEXT " KING OF POPS"
Page created at 2019-04-25 0:00:04, Patent Auction Time.